Jo is the Chief Operating Officer (COO) and Senior Counsel to the Consumer Banking and Corporate Regulatory Division of the Wells Fargo Law Department. While the title is a mouth full, it’s clear that she is making a major impact in shaping and driving the legal pathway of one of the Big US Banks. And not only that she has a black belt if you make her work too hard to win you over. Perseverance is key to success. Never quit. Joycelyn Eason knew how to work hard when she was in the military. While she was deploying overseas, in addition to her military gear, she took a bag full of books in order to complete a Masters Degree. When she came home the next step was to go to law school. After succeeding in that, she worked at a law firm using her innate intuition for solving tough problems to make an impact. Once she had two children, though she wanted a new challenge and a change of pace. She turned to becoming an in-house attorney for Wells Fargo. 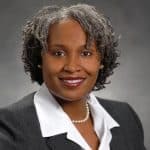 While there, she’s progressed through the ranks to ultimately become Chief Operating Officer (COO) and Senior Counsel to the Consumer Banking and Corporate Regulatory Division of the Wells Fargo Law Department. She still managed to become a first-degree black belt and be a great wife and mother at the same time. Learn how she added the strength to believe in her position to the ability to learn from anyone and the humility to know when to concede the point to become a top-notch lawyer.